This article is about the tree. For other uses, see Spruce (disambiguation). A spruce is a tree of the genus Picea /paɪˈsiːə/,  a genus of about 35 species of coniferous evergreen trees in the family Pinaceae, found in the northern temperate and boreal ( taiga) regions of the Earth. Spruces are large trees, from about 20–60 m (about 60–200 ft) tall when mature, and have whorled branches and conical form. They can be distinguished from other members of the pine family by their needles (leaves), which are four-sided and attached singly to small persistent peg-like structures ( pulvini or sterigmata ) on the branches, and by their cones (without any protruding bracts), which hang downwards after they are pollinated. The needles are shed when 4–10 years old, leaving the branches rough with the retained pegs. In other similar genera, the branches are fairly smooth. Spruce are used as food plants by the larvae of some Lepidoptera (moth and butterfly) species, such as the eastern spruce budworm. They are also used by the larvae of gall adelgids (Adelges species). 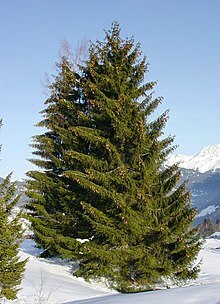 The word spruce comes from a Middle English adjective spruse which literally meant from Prussia. The adjective comes from an unknown alteration of an Old French form of Prussia - Pruce, which itself comes from New Latin, which adapted it from Old Prussian. The peg-like base of the needles, or pulvinus, in Norway spruce (Picea abies). Pulvini remain after the needles fall (white spruce, Picea glauca). Determining that a tree is a spruce is not difficult; evergreen needles that are more or less quadrangled, and especially the pulvinus, give it away. Beyond that, determination can become more difficult. Intensive sampling in the Smithers/Hazelton/Houston area of British Columbia showed Douglas (1975),  according to Coates et al. (1994),  that cone scale morphology was the feature most useful in differentiating species of spruce; the length, width, length: width ratio, the length of free scale (the distance from the imprint of the seed wing to the tip of the scale), and the percentage free scale (length of free scale as a percentage of the total length of the scale) were most useful in this regard. Daubenmire (1974),  after range-wide sampling, had already recognized the importance of the 2 latter characters. Taylor (1959)  had noted that the most obvious morphological difference between typical Picea glauca and typical P. engelmannii was the cone scale, and Horton (1956,1959)   found that the most useful diagnostic features of the 2 spruces are in the cone; differences occur in the flower, shoot and needle, "but those in the cone are most easily assessed" (Horton 1959). Coupé et al. (1982)  recommended that cone scale characters be based on samples taken from the midsection of each of 10 cones from each of 5 trees in the population of interest. Without cones, morphological differentiation among spruce species and their hybrids is more difficult. Species classification for seeds collected from spruce stands in which introgressive hybridization between white and Sitka spruces (P. sitchensis) may have occurred is important for determining appropriate cultural regimens in the nursery. If, for instance, white spruce grown at container nurseries in southwestern British Columbia are not given an extended photoperiod, leader growth ceases early in the first growing season, and seedlings do not reach the minimum height specifications. But, if an extended photoperiod is provided for Sitka spruce, seedlings become unacceptably tall by the end of the first growing season . Species classification of seedlots collected in areas where hybridization of white and Sitka spruces has been reported has depended on (i) easily measured cone scale characters of seed trees, especially free scale length, (ii) visual judgements of morphological characters, e.g., growth rhythm, shoot and root weight, and needle serration, or (iii) some combination of (i) and (ii) (Yeh and Arnott 1986). Useful to a degree, these classification procedures have important limitations; genetic composition of the seeds produced by a stand is determined by both the seed trees and the pollen parents, and species classification of hybrid seedlots and estimates of their level of introgression on the basis of seed-tree characteristics can be unreliable when hybrid seedlots vary in their introgressiveness in consequence of spatial and temporal variations in contributions from the pollen parent (Yeh and Arnott 1986). Secondly, morphological characters are markedly influenced by ontogenetic and environmental influences, so that to discern spruce hybrid seedlot composition with accuracy, hybrid seedlots must differ substantially in morphology from both parent species. Yeh and Arnott (1986)  pointed out the difficulties of estimating accurately the degree of introgression between white and Sitka spruces; introgression may have occurred at low levels, and/or hybrid seed lots may vary in their degree of introgression in consequence of repeated backcrossing with parental species. Spruce seedlings are most susceptible immediately following germination, and remain highly susceptible through to the following spring. More than half of spruce seedling mortality probably occurs during the first growing season and is also very high during the first winter,  when seedlings are subjected to freezing damage, frost heaving and erosion, as well as smothering by litter and snow-pressed vegetation. Seedlings that germinate late in the growing season are particularly vulnerable because they are tiny and have not had time to harden off fully. Mortality rates generally decrease sharply thereafter, but losses often remain high for some years. "Establishment" is a subjective concept based on the idea that once a seedling has successfully reached a certain size, not much is likely to prevent its further development. Criteria vary, of course, but Noble and Ronco (1978),  for instance, considered that seedlings 4 to 5 years old, or 8 cm to 10 cm tall, warranted the designation "established", since only unusual factors such as snow mold, fire, trampling, or predation would then impair regeneration success. Eis (1967)  suggested that in dry habitats on either mineral soil or litter seedbeds a 3-year-old seedling may be considered established; in moist habitats, seedlings may need 4 or 5 years to become established on mineral soil, possibly longer on litter seedbeds. Growth remains very slow for several to many years. Three years after shelterwood felling in subalpine Alberta, dominant regeneration averaged 5.5 cm in height in scarified blocks, and 7.3 cm in non-scarified blocks (Day 1970),  possibly reflecting diminished fertility with the removal of the A horizon. Spruce is one of the most important woods for paper uses, as it has long wood fibres which bind together to make strong paper. The fibres are thin walled and collapse to thin bands upon drying. Spruces are commonly used in mechanical pulping as they are easily bleached. Together with northern pines, northern spruces are commonly used to make NBSK. Spruces are cultivated over vast areas as pulpwood. The fresh shoots of many spruces are a natural source of vitamin C.  Captain Cook made alcoholic sugar-based spruce beer during his sea voyages in order to prevent scurvy in his crew. The leaves and branches, or the essential oils, can be used to brew spruce beer. The tips from the needles can be used to make spruce tip syrup[ clarification needed]. In survival situations spruce needles can be directly ingested or boiled into a tea. This replaces large amounts of vitamin C. Also, water is stored in a spruce's needles, providing an alternative means of hydration[ clarification needed]. Spruce can be used as a preventive measure for scurvy in an environment where meat is the only prominent food source[ clarification needed]. Spruce is the standard material used in soundboards for many musical instruments, including guitars, mandolins, cellos, violins, and the soundboard at the heart of a piano and the harp. Wood used for this purpose is referred to as tonewood. Spruce, along with cedar, is often used for the soundboard/top of an acoustic guitar. The main types of spruce used for this purpose are Sitka, Engelmann, Adirondack and European spruces. The resin was used in the manufacture of pitch in the past (before the use of petrochemicals); the scientific name Picea derives from Latin picea "pitch pine" (referring to Scots pine),  from piceus, an adjective from pix "pitch". Spruces are popular ornamental trees in horticulture, admired for their evergreen, symmetrical narrow-conic growth habit. For the same reason, some (particularly Picea abies and P. omorika) are also extensively used as Christmas trees, with artificial Christmas trees often being produced in their likenesses. Spruce branches are also used at Aintree racecourse, Liverpool, to build several of the fences on the Grand National course. It is also used to make sculptures. The picture shows the structure of spruce tree cells. Spruce belongs to the genus of coniferous evergreen trees of the pine family. There are about 40 species. It is one of the main forest-forming species. From it are obtained tar, turpentine, rosin. The closely related species Sirococcus conigenus and S. piceicola cause shoot blight and seedling mortality of conifers in North America, Europe, and North Africa. Twig blight damage to seedlings of white and red spruces in a nursery near Asheville, North Carolina, was reported by Graves (1914). Hosts include white, black, Engelmann, Norway, and red spruces, although they are not the plants most commonly damaged. Sirococcus blight of spruces in nurseries show up randomly in seedlings to which the fungus was transmitted in infested seed. First-year seedlings are often killed, and larger plants may become too deformed for planting. Outbreaks involving < 30% of spruce seedlings in seedbeds have been traced to seed lots in which only 0.1% to 3% of seeds were infested. Seed infestation has in turn been traced to the colonization of spruce cones by S. conigenus in forests of the western interior. Infection develops readily if conidia are deposited on succulent plant parts that remain wet for at least 24 hours at 10 °C to 25 °C. Longer periods of wetness favour increasingly severe disease. Twig tips killed during growth the previous year shows a characteristic crook. A branch and stem canker associated with the fungus Valsa kunzei Fr. var. picea was reported on white and Norway spruces in Ontario (Jorgensen and Cafley 1961)  and Quebec (Ouellette and Bard 1962). In Ontario, only trees of low vigour were affected, but in Quebec vigorous trees were also infected. Small mammals consume conifer seeds, and also eat seedlings. Cage feeding of deer mice (Peromyscus maniculatus) and red-backed vole (Myodes gapperi) showed a daily maximum seed consumption of 2000 white spruce seeds and of 1000 seeds of lodgepole pine, with the 2 species of mice consuming equal amounts of seed, but showing a preference for the pine over the spruce (Wagg 1963). The short-tailed meadow vole (Microtus pennsylvanicus Ord) voraciously ate all available white spruce and lodgepole pine seedlings, pulling them out of the ground and holding them between their front feet until the whole seedling had been consumed. Wagg (1963)  attributed damage observed to the bark and cambium at ground level of small white spruce seedlings over several seasons to meadow voles. An important albeit indirect biotic constraint on spruce establishment is the depredation of seed by squirrels. As much as 90% of a cone crop has been harvested by red squirrels (Zasada et al. 1978). Deer mice, voles, chipmunks, and shrews can consume large quantities of seed; 1 mouse can eat 2000 seeds per night (Radvanyi 1970b). Repeated applications of half a million seeds/ha failed to produce the 750 trees/ha sought by Northwest Pulp and Power, Ltd., near Hinton, Alberta (Radvanyi 1972),  but no doubt left a lot of well-fed small mammals. Foraging by squirrels for winter buds (Rowe 1952)  has not been reported in relation to young plantations, but Wagg (1963)  noted that at Hinton AB, red squirrels were observed cutting the lateral and terminal twigs and feeding on the vegetative and flower buds of white spruce. Red squirrels in Alaska have harvested as much as 90% of a cone crop (Zasada et al. 1978);  their modus operandi is to cut off great numbers of cones with great expedition early in the fall, and then "spend the rest of the fall shelling out the seeds". In Manitoba, Rowe (1952)  ascribed widespread severing of branch tips 5 cm to 10 cm long on white spruce ranging "from sapling to veteran size" to squirrels foraging for winter buds, cone failure having excluded the more usual food source. The damage has not been reported in relation to small trees, outplants or otherwise. Porcupines (Erethizon dorsatum L.) may damage spruce (Nienstaedt 1957),  but prefer red pine (McLeod 1956). Bark-stripping of white spruce by black bear (Euarctos americanus perniger) is locally important in Alaska (Lutz 1951),  but the bark of white spruce is not attacked by field mice (Microtus pennsylvanicus Ord) (Littlefield et al. 1946),  even in years of heavy infestation. Horntails, or Wood Wasps, use this tree for egg laying and the larvae will live in the outer inch of the tree under the bark. Spruce Beetles (Dendroctonus rufipennis) have destroyed swathes of spruce forest in western North America from Alaska to Wyoming. ^ Hart, G.T. (2018) Plants in Literature and Life: a wide-ranging dictionary of botanical terms. available on iBooks. ^ "Pine Relatives". Lovett Pinetum. Retrieved 27 August 2018. ^ "Swedish Spruce Is World's Oldest Tree: Scientific American Podcast". 27 May 2008. Retrieved 21 August 2016. ^ "Origin and meaning of spruce by Online Etymology Dictionary". ^ a b Jin-Hua Ran; Xiao-Xin Wei; Xiao-Quan Wang (2006). "Molecular phylogeny and biogeography of Picea (Pinaceae): implications for phylogeographical studies using cytoplasmic haplotypes" (PDF). Molecular Phylogenetics and Evolution. 41 (2): 405–419. doi: 10.1016/j.ympev.2006.05.039. PMID 16839785. Archived from the original (PDF) on 24 April 2012. ^ Aðalsteinn Sigurgeirsson & Alfred E. Szmidt (1993). "Phylogenetic and biogeographic implications of chloroplast DNA variation in Picea". Nordic Journal of Botany. 13 (3): 233–246. doi: 10.1111/j.1756-1051.1993.tb00043.x. ^ "Search results — The Plant List". www.theplantlist.org. ^ Coates, K.D. ; Haeussler, S.; Lindeburgh, S.; Pojar, R.; Stock, A.J. 1994. Ecology and silviculture of interior spruce in British Columbia. Canada/British Columbia Partnership Agreement For. Resour. Devel., Victoria BC, FRDA Rep. 220. 182 p.
^ Daubenmire, R. 1974. Taxonomic and ecologic relationships between Picea glauca and Picea engelmannii. Can. J. Bot. 52(7):1545–1560. ^ Taylor, T.M.C. 1959. The taxonomic relationship between Picea glauca (Moench) Voss and P. engelmannii Parry. Madrono 15(4):111–115. (Cited in Coates et al. 1994). ^ Horton, K.W. 1956. A taxonomic and ecological study of Picea glauca and Picea engelmannii in North America. Diploma thesis, Oxford Univ., U.K. 103 p.
^ a b Horton, K.W. 1959. Characteristics of subalpine spruce in Alberta. Can. Dep. Northern Affairs National Resour., For. Branch, For. Res. Div., Ottawa ON, Tech. Note 76. 20 p.
^ Coupé, R.; Ray, C.A. ; Comeau, A.; Ketcheson, M.V. ; Annas, R.M. 1982. A guide to some common plants of the Skeena area, British Columbia. B.C. Min. For., Res. Branch, Victoria BC. ^ Arnott, J.T. 1974. Germination and seedling establishment. p. 55–66 in Cayford, J.H. (Ed.). Direct Seeding Symposium, Timmins ON, Sept. 1973, Can. Dep. Environ., Can. For. Serv., Ottawa ON, Proc., Publ. 1339. ^ Arnott, J.T. (1979). "Effect of light intensity during extended photoperiod on growth of amabalis fir, mountain hemlock, and white and Engelmann spruce seedlings". Can. J. For. Res. 9: 82–89. doi: 10.1139/x79-014. ^ a b c d Yeh, F.C. ; Arnott, J.T. (1986). "Electrophoretic and morphological differentiation of Picea sitchensis, Picea glauca, and their hybrids". Can. J. For. Res. 16 (4): 791–798. doi: 10.1139/x86-140. ^ Alexander, R.R. 1987. Ecology, silviculture, and management of the Engelmann spruce–subalpine fir type in the central and southern Rocky Mountains. USDA, For. Serv., Washington DC, Agric. Handb. 659. 144 p.
^ Noble, D.L. ; Ronco, F. 1978. Seedfall and establishment of Engelmann spruce and subalpine fir in clearcut openings in Colorado. USDA, For. Serv., Rocky Mountain For. Range Exp. Sta., Res. Pap. RM-200. 12 p.
^ Eis, S. 1967. Establishment and early development of white spruce in the interior of British Columbia. For. Chron. 43:174–177. ^ Day, M.W. ; Rudolph, V.J. 1970. Development of a white spruce plantation. Michigan State Univ., Agric. Exp. Sta., East Lansing MI, Res. Pap. 111. 4 p.
^ "Milestones of Flight - 1903 Wright Flyer". Smithsonian National Air and Space Museum. 28 April 2016. Archived from the original on 5 April 2004. Retrieved 21 August 2016. ^ "Tree Book - Sitka spruce (Picea sitchensis)". British Columbia Ministry of Forests, Lands and Natural Resource Operations. Retrieved 29 July 2006. ^ Crellin, J. K. (2004). A social history of medicines in the twentieth century: to be taken three times a day. New York: Pharmaceutical Products Press. p. 39. ISBN 978-0789018441. Retrieved 21 August 2016. ^ Stubbs, Brett J. (June 2003). "Captain Cook's beer: the antiscorbutic use of malt and beer in late 18th century sea voyages" (PDF). Asia Pacific Journal of Clinical Nutrition. 12 (2): 129–137. Archived from the original (PDF) on 25 July 2008. Retrieved 21 August 2016. ^ "Page not found". www.coolhemp.com. Archived from the original on 6 October 2018. Retrieved 10 January 2019. ^ pĭcĕa. Charlton T. Lewis and Charles Short. A Latin Dictionary on Perseus Project. ^ Rossman, AY; Castlebury, LA; Farr, DF; Stanosz, GR (2008). "Sirococcus conigenus, Sirococcus piceicola sp. nov. and Sirococcus tsugae sp. nov. on conifers: anamorphic fungi in the Gnomoniaceae, Diaporthales". Forest Pathology. 38: 47–60. doi: 10.1111/j.1439-0329.2007.00529.x. ^ Graves, A.H. 1914. Notes on diseases of trees in the southern Appalachians. Phytopath. 4:63–72. ^ Davis, C. 1997. [24 September] Tree talk. The Sault Star, Sault Ste. Marie, Ontario. Wednesday, 24 September 1997. p. B2. ^ Jorgensen, E. and Cafley, J.D. 1961. Branch and stem cankers of white and Norway spruces in Ontario. For. Chron. 37(4):394–400. ^ Ouellette, G.B. ; Bard, G. 1962. Observations on a canker and resinosis in white and Norway spruce. Can. Dep. For., For. Ent. Path. Branch, Ottawa ON, Bi-mo. Progr. Rep.18(2):2. ^ a b c Wagg, J.W.B. 1963. Notes on food habits of small mammals of the white spruce forest. For. Chron. 39(4):436–445. ^ Schopmeyer, C.S. ; Helmers, A.E. 1947. Seeding as a means of reforestation in the northern Rocky Mountain Region. USDA For. Serv., Washington DC, Circular 772. 30 p.
^ a b Zasada, J.C.; Foote, M.J.; Deneke, F.J.; Parkerson, R.H. 1978. Case history of an excellent white spruce cone and seed crop in interior Alaska: cone and seed production, germination and seedling survival. USDA, For. Serv., Pacific NW For. Range Exp. Sta., Portland OR, Gen. Tech. Rep. PNW-65. 53 p.
^ Radvanyi, A (1970b). "Small mammals and regeneration of white spruce forests in western Alberta". Ecology. 51 (6): 1102–1105. doi: 10.2307/1933641. JSTOR 1933641. ^ Radvanyi, A. 1972. Small mammals and regeneration of white spruce in western Alberta. p. 21–23 in McMinn, R.G. (Ed.). White Spruce: Ecology of a Northern Resource. Can. Dep. Environ., Can. For. Serv., Edmonton AB, Inf. Rep. NOR-X-40. ^ a b Rowe, J.S. 1952. Squirrel damage to white spruce. Can. Dep. Resour. Devel., For. Branch, For. Res. Div., Ottawa ON, Silv. Leafl. 61. 2 p.
^ Nienstaedt, H. 1957. Silvical characteristics of white spruce (Picea glauca). USDA, For. Serv., Lake States For. Exp. Sta., St. Paul MN, Pap. 55. 24 p.
^ McLeod, J.W. 1956. Plantations of the Acadia Forest Experiment Station. Can. Dep. Northern Affairs National Resour., For. Branch, For. Res. Div., Ottawa ON, Tech. Note 31. 25 p.
^ Lutz, H.J. 1951. Damage to trees by black bears in Alaska. J. For. 49:522–523. ^ Littlefield, E.W. ; Schoomaker, W.J. ; Cook, D.B. 1946. Field mouse damage to coniferous plantations. J. For. 44:745–749. ^ Out Of Print : Biosystematic Studies of Conifer-Feeding Choristoneura (Lepidoptera Tortricidae) in the Western United States : Edited by Jerry A. Powell - University of California Press. www.ucpress.edu. Retrieved 23 October 2017. ^ Balch, R.E. ; Webb, F.E. ; Morris, R.F. 1954. Results of spraying against spruce budworm in New Brunswick. Can. Dep. Agric., For. Biol. Div., Ottawa ON, Bi-mo. Progr. Rep. 10(1). ^ Allison, Jeremy D.; Carde, Ring T. (2016). Pheromone Communication in Moths: Evolution, Behavior, and Application. Univ of California Press. pp. 265–271. ISBN 9780520964433. ^ Birol I, Raymond A, Jackman SD, Pleasance S, Coope R, Taylor GA, Yuen MM, Keeling CI, Brand D, Vandervalk BP, Kirk H, Pandoh P, Moore RA, Zhao Y, Mungall AJ, Jaquish B, Yanchuk A, Ritland C, Boyle B, Bousquet J, Ritland K, Mackay J, Bohlmann J, Jones SJ (2013) Assembling the 20 Gb white spruce (Picea glauca) genome from whole-genome shotgun sequencing data. Bioinformatics 29. 1492-1497. Wikisource has the text of the 1879 American Cyclopædia article Spruce.